We have a nice batch of insect and spider photos from reader Mark Sturtevant, whose notes are indented. And be sure to send in your good wildlife photos. 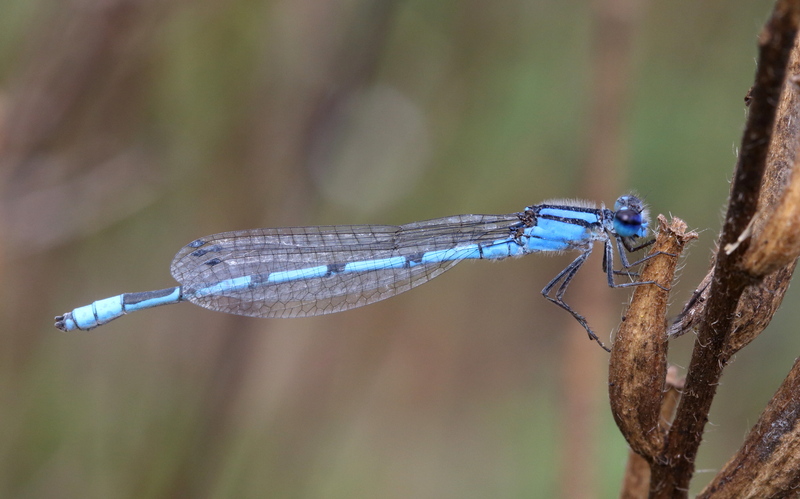 There are numerous species of damselflies that are known as ‘bluets’, so-named because for most species the males and sometimes females are blue in color. 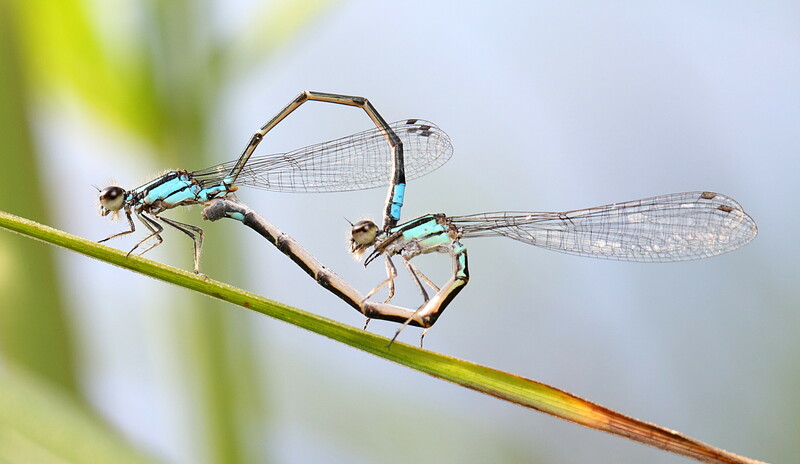 The first picture is of a male familiar bluet (Enallagma civile), and the second picture is a mating pair of skimming bluets (Enallagma geminatum). 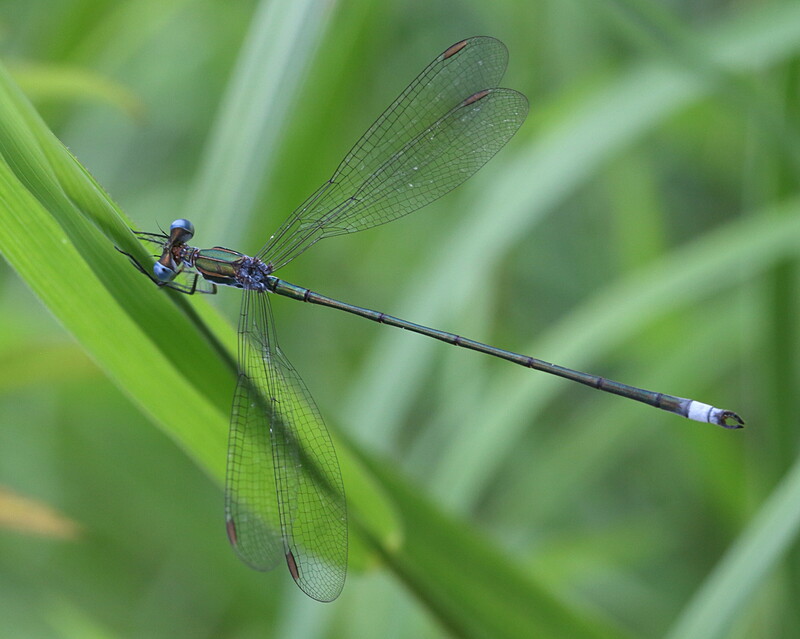 Continuing with damselflies, the next three pictures are of one of our spreadwing damselflies, which are damselflies that sit with their wings slightly open. 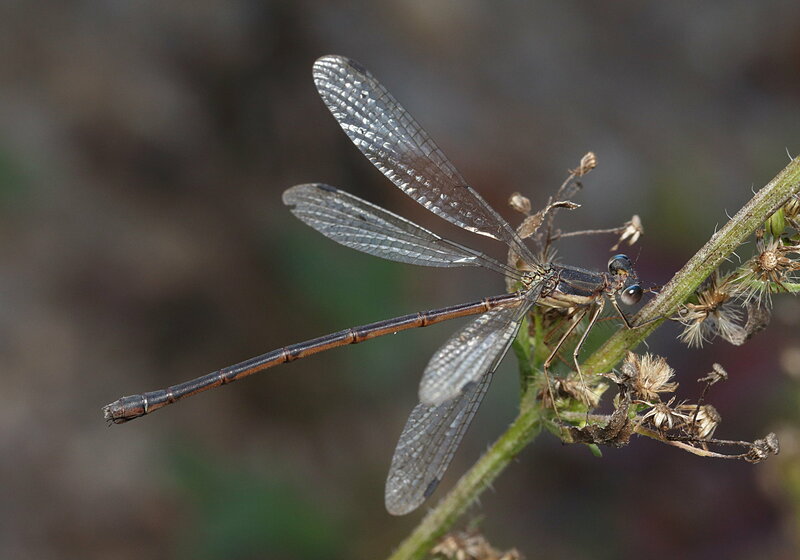 The ones shown are slender spreadwings (Lestes rectangularis). The first is a female, and the others are males. 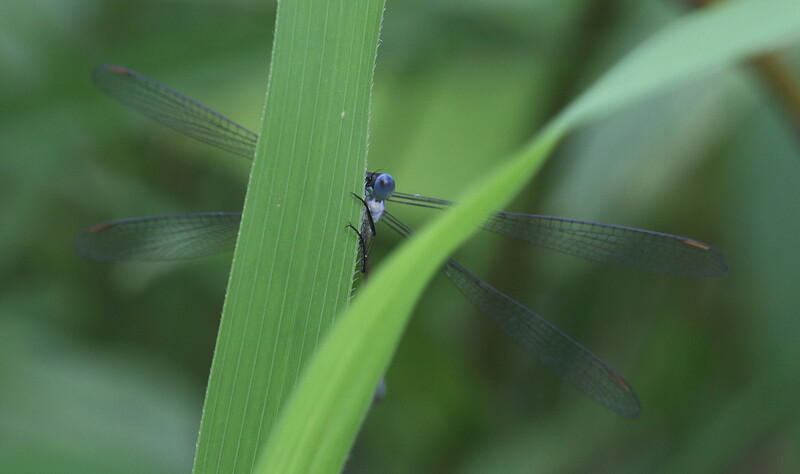 The shy male damselfly shown in the third picture is one of my favorite pictures from last summer. 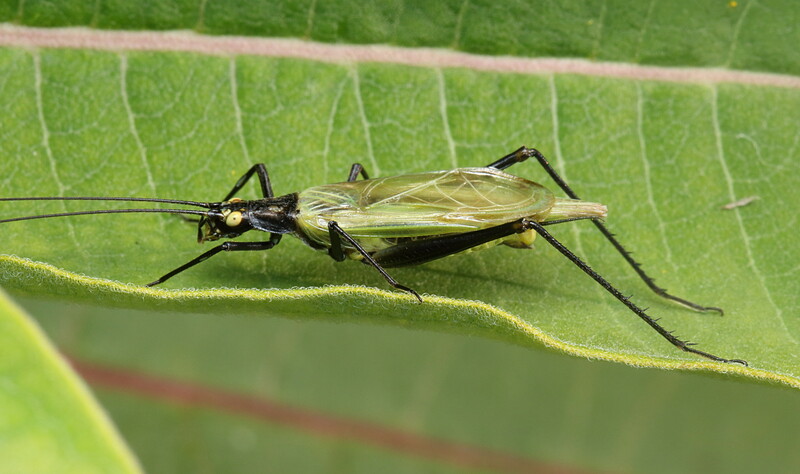 The next two pictures are of tree crickets in the genus Oecanthus. These can be hard to identify to species, and many are identifiable only by song and geographic region. I don’t know about their songs, but based on the geographic location I favor these to be O. forbesi. The first cricket is a female, and the second is an especially dapper looking male. Finally, we return to the Magic Field for a Spider of Unusual Size. Here and there on the ground are burrows made by some arthropod or other. Some of these have a low turret of plant matter that is loosely woven together with silk. 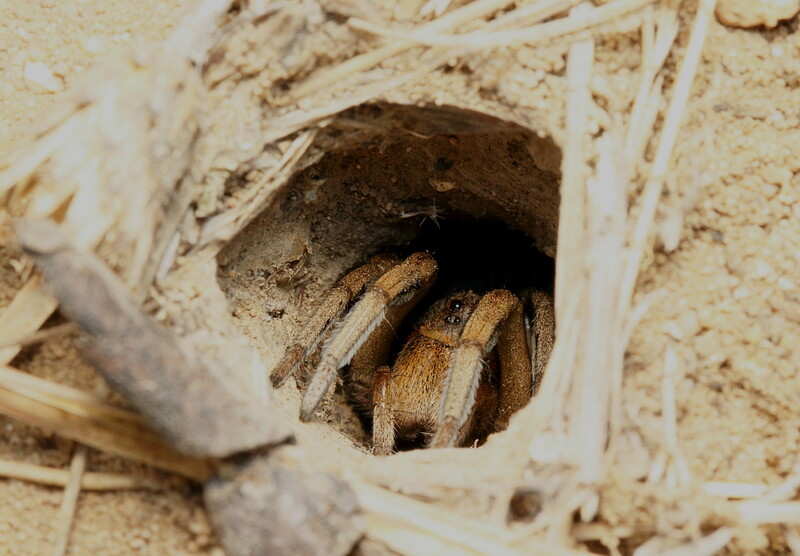 These are the burrows of burrowing wolf spiders (likely genus Geolycosa). I would often use an LED light from my phone to peer into one of the holes, and I could generally see glittering eyes staring back. The first picture is one of the spiders sitting at the entrance to her lair. I very much wanted to catch one for pictures, but the only approach that worked was to simply dig one out. So I dug a vertical pit alongside a burrow, and after going down about a foot I then dug a horizontal connection to the spider burrow and pushed her out from below. She emerged only reluctantly. I think the species is G. missouriensis. She is easily the biggest wolf spider that I have seen. 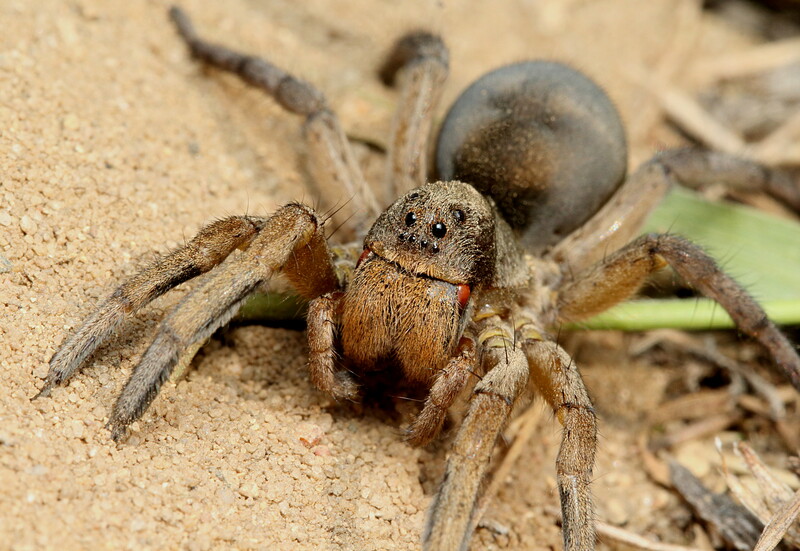 The shiny knobs under her face are parts of the joint condyles for her chelicerae, and these give the impression that she can bite pretty hard. After a few pictures she was returned to her burrow and the adjacent pit was filled in. This entry was written by whyevolutionistrue and posted on August 1, 2018 at 7:45 am and filed under insects, photography, spiders. Bookmark the permalink. Follow any comments here with the RSS feed for this post. Both comments and trackbacks are currently closed. I love how you recruited the wolf spider out for her photo op. Thank you and look forward to seeing more posts! Hi! That wolf spider is magnificent and I enjoy your activities. I was sure she had a red mite on her “face” but on blowing it up, I saw a symmetrical red mark on the other side. She is gorgeous. Those are the joint condyles. Thanks for the warning ,I managed to look at both photos ,re it’s bite how painful are they ? I am sure it will hurt like the dickens. I was careful to not test this, having learned from a different species of Big Wolf Spider that they should not be handled. Not even gently. Hi ,thanks for the reply ,great photos by the way . Lovely photos, as always. Thanks! Lovely photos! How big is that wolf spider? There wasn’t much in the pictures to give a sense of scale. I suppose the body was about an inch long. In terms of leg span, it was I guess about 3 inches across. Not as big in leg span as, say, our nursery web spiders (another big spider). But it was much more robust in build. I had learned more recently that the heavy looking chelicerae are modifications for digging. They use these appendages as shovels to make their burrows. Thanks for answering Paul. I was going to ask the same question. Thanks for the cool arthropod photos. Fantastic images as always Mark. I was particularly taken with the tree crickets. We have a few here in Australia as well but not so colourful that I know of. Fabulous pics Mark! Most enjoyable. Great photos, as always! However, I believe the spreadwings are actually Swamp (Lestes vigilax) not Slender. Slender have pale yellow veins at the wing tips, which are not evident in the photos. Also, male vigilax have longer, more slender terminal appendages (cerci and paraprocts), a reddish shoulder stripe (blue-green in rectangularis), metallic green on the upper thorax and abdomen (mostly brown in rectangularis), and pale bluish pruinosity on abdominal segments 9 and 10 (only sometimes slightly pruinose on S9 in rectanglaris). I always look forward to your contributions, Mark! These are spectacular photos! As always, enhanced all the more by the biology notes appended. 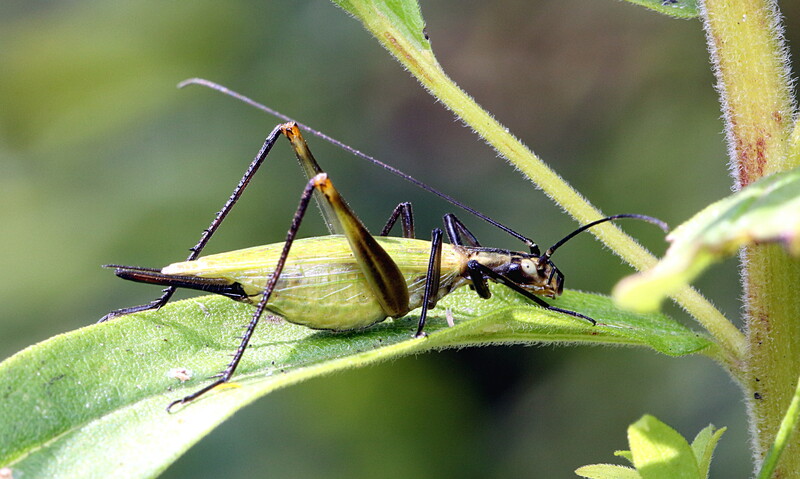 “Dapper” is such an apt descriptor for that tree cricket.